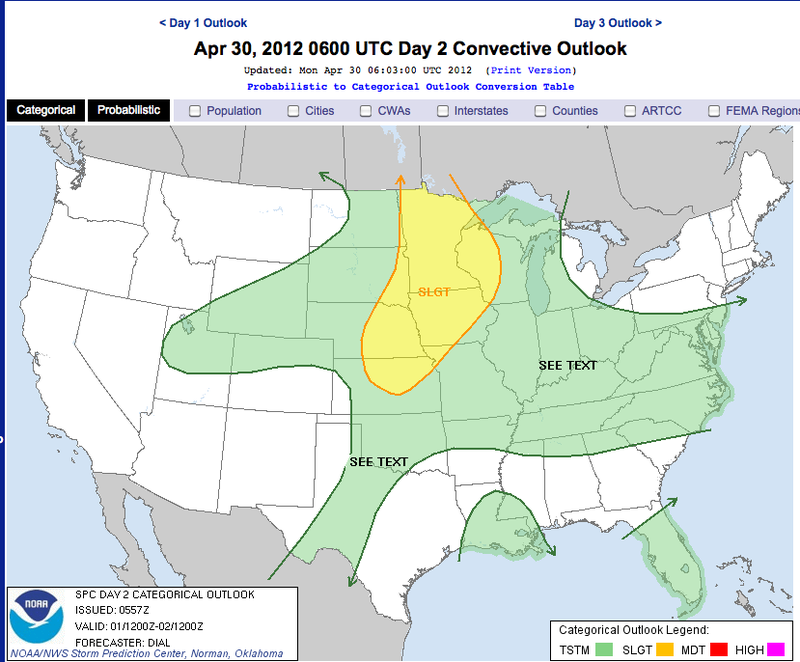 The Minnesota Forecaster: Severe Tuesday? WISCONSIN...MOST LIKELY NORTHWEST THROUGH NORTH OF MINNEAPOLIS. QUESTION...WITH THE RISK FOR A STRONG TORNADO. My favorite thing about severe weather is trying to see exactly where the tornado threat will be. Mesoscale meteorology at its finest. I still like tomorrows set up for some severe storms, as mentioned in a previous blog. There is something that I am a bit concerned about, and that is the lack of capping early in the day. This may confuse some people because we always hear about how a cap will reduce our severe risk. However, a cap is needed during the day to prevent storms from firing up before peak heating and instability can be reached. This is something that does concern me...that any little trigger or outflow boundary from early morning storms will set off thunderstorms before good instability can build. If this happens widespread enough, we could end up being stuck in clouds and the severe risk will drop dramatically. It seems like the models aren't showing this happening, but it is something to keep in mind tomorrow. Still...keep an eye to the sky, because storms appear to be on the horizon. Expect any activity to not move through until after dark in eastern MN and western WI. More should be cleared up later tonight and tomorrow morning. looks like the US Models are coming in line with the Euro solution, keeping the best instability south of the metro or over the metro. This does cause some concern, as often times the strongest storms do set up on the northern side of the best cape values. Please everyone make sure you are aware of your surroundings tomorrow, if you can take a look at the radar and leave a bit early from work, if the situation warrants it please do. And map out the best way home, not necessarily the fastest, don't get stuck on the freeways. I'm starting to smell somewhat of a bust...clouds may not start to clear until after the noon hour. We'll need all the heating we can get tomorrow...but I'm fully prepared to be disappointed. Avoiding destruction would be good though. Time to print off the surface plots and break out the colored pencils. Td approaching 60 already in eastern SD. Sorry. Not sure why I didn't just type out dewpoint. I'm going with Duane on this,bust,but in a good way,were approaching the noon hour and still no sun,temps only in the high 50's=no heating occuring,its quite alright though no need for tornadoes to ruin lives and property.but I will take any rainfall to help our drought situation just as long as nothing severe comes with it. Peeking at satellite, the clouds are breaking apart quite rapidly. Most areas including the metro should get into the clearing by the time we reach our peak heating hours. Still a good idea to stay aware on what's going on this afternoon and tonight. Tomorrow we will be fully in the warm sector, and again things will depend on how much clearing we see after tonight's storms. I've always had fun doing hand analysis for svr weather events. I'd say things are looking pretty good for SW Minnesota. Interesting. Where did you get the plot on which to draw? Its from a software called Digital Atmosphere. Its just able to make cleaner plots then anything else available online. Also, our first cell has popped near Pipestone. I've been waiting for anything on radar as we've finally gotten some surface convergence to spark something. Now to see if it can break the cap. Hmm...NO sun, windy, not anywhere near approaching high 70's. Another bust you think? I think so! Its 2:30. The storms will develop. The tornado risk will be highest in western Minnesota where the SPC is forecasting. It will become linear and move across the state. The metro was never going to get storms before 7 or 8pm. Storm with rotation that has previously produced a tornado about to move into St. Cloud, a major Minnesota city and as of 6:08 none of the stations are doing live coverage of it. They've all been talking about. KARE even broken into national news. Not sure what more you can expect. IMO when you have a storm that has produced tornadoes moving towards a city of 65,000 people you should be doing non-stop coverage. I'd give the SPC an A- personally. Good forecast by them. Well now the argument will be there as to whether or not this would be considered a bust or not. In my eyes, I would say no. Some really nice storms did end up firing with a couple stronger ones near St. Cloud and Annandale. I don't know though what people really expect to get when slight risks are issued by the SPC. In my eyes this is typical...and I think tomorrow will potentially be even more active given the frontal boundary stalling out close by, and maybe several outflow boundaries from overnight storms could potentially trigger another round of severe storms. Also we'll be in the warm sector already so instability values should get pretty high. Since the front will be stalled, some areas could see several rounds of strong storms tomorrow. Keep an eye out as this active pattern we are in continues. no I don't think this was a bust, the metro was on the far eastern edge of the 30% hatched hail chance, the 2 and 5% chance of tornado was just about right. If anything was a bust it was the extension of the tornado watch eastward to include the metro and west central Wi. Overall grade from me for the SPC would be B-. Now for the American Models as of the 18z runs yesterday, they insisted that we would be under 1500- to maybe 2500 cape values. Yet with their 12z runs just 6 hours before they showed 40-to maybe 70% cloud coverage as viewed on the E-wall site, at that time I was starting to think,(but didn't bite)that the severe potential for the metro was beginning to wane. From what I could see after 4pm this afternoon, the best that MN got was around 1000 J/km. The Euro for the last day or two was not as strong with the cape values. Well, they canceled the T watch. Not a bust for central Minnesota, but definitely a bust for the Twin Cities. Duane: hope you're right. Good analysis. really not surprising, the wind profiles for the last two hours from the radar at MPX did not suggest rotating updrafts. Newest updates from the SPC aren't encouraging, and the models are waning down with their instability. The high resolution NAM model however is cranking up the instability for tomorrow. I'm really interested to see how Wednesday does end up playing out. The thing with fronts is heavy convection can slow or completely stop their movement. The storms moving through now have stalled the cold front out west, and that won't move east until the stuff in western WI moves off to the east. This front will be a focus for redevelopment during Wednesday afternoon (again depending on how quickly clouds kick out of here). There is a second warm front moving in from the south, and south of that second warm front is an even greater tap of instability. That front looks to be right on the MN/IA border during the afternoon so much like today, and tornadic storms will likely be focused on that warm front. SPC 5% risk area looks good where it is. General storm movement should be ENE, much like today. I'm very curious to see how today does play out...but if I was chasing, anywhere between Highway 20 in IA and I-90 in MN looks decent.